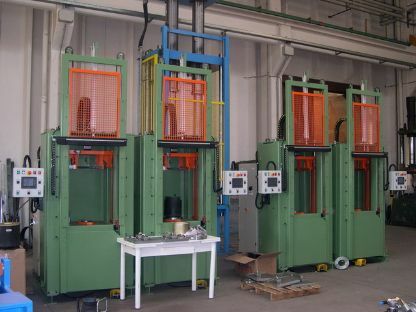 The machine is designed for the mounting of the membrane on the piston as on the oppositeside the plate was already crimped previously in the Crimping Machine. The operator puts on the bottom plate the piston, then overlaps the membrane by inserting on upper tooling the plate’s outriggers, manually makes the centring on the piston and via a foot pedal activates it. The operational sequence of the described above functions is handled automatically by pneumatic and electrical control equipment, which determines if the air spring is accepted or scrapped.